When Yulia Laricheva saw someone have a heart attack in the office of a New York City advertising firm, she knew something needed to change. At the time, she was afraid to talk to management about the work culture. "If we spoke out, we would get blacklisted, retaliated against or fired," she said. Laricheva said the expectation that she would work at all hours of the day started to affect her own health. "It was making me sick. I was having heart palpitations, I was stressed, I couldn't disconnect," she said. "I'm very committed to my job. But there has to come a time when you say pencils down, when you go home and rest." Now, Laricheva, a Brooklyn resident, is supporting a bill introduced by New York City Councilman Rafael L. Espinal Jr. called the "Right to Disconnect." The proposed bill would make it illegal for private employers in New York City with 10 or more employees to require their workers to check and respond to electronic communications during non-work hours. "I think it's no secret that technology has really blurred the lines between our work hours and personal time," Espinal said. "It was time government had a serious conversation about how to create real protection for workers who are really easily accessible." Espinal said the bill was designed for workers who are "supposed to work seven to eight hours a day but are putting in 12 hours because they are accessible outside the office." "This does not mean your boss cannot reach out after work hours," Espinal explained. "It means that for whatever reason, if you decide not to respond, you don't have to fear you will be without a job the next day." The bill includes some exemptions, Espinal said. "There are jobs that require workers to be on 24 hours," he said. "If your contract clearly states that your duties require you to be on-call, then these protections don't apply to you." Similar legislation has been considered in Europe. In France, a law requires businesses with 50 or more workers to include the right to disconnect in annual negotiations with staff. Germany doesn't have "right to disconnect" laws on the books, but many companies offer it to their employees. "The way I see it, this bill is just about creating more fairness," said Larissa K. Barber, a psychology professor at San Diego State University who studies how technology affects work-life balance. "Many labor laws haven't kept up with the changing nature of work," Barber said. "Now, we have 'boundary-less' work that spills over into remote work spaces, like our homes." This "boundary-less" work creates a feeling Barber calls "workplace telepressure." "It's the preoccupation and urge to respond quickly to text-based messages, like text messages or emails" Barber said. "If I get an email from you, I know that you know I have access to that email very quickly. Then, I get worried if I don't respond, you'll think it's some sort of a social snub." "Workplace telepressure" doesn't just create anxiety, Barber's studies have shown. "We did see that people who experience more 'telepressure' are more likely to experience work burnout and report more sleep quality issues," Barber said. "I don't think people should be penalized for not working during off-hours," Anthony Limongi, an editor in Manhattan, told NBC News. "For your mental health, you need that space and boundaries. Overwork isn't just stressing people out short term, it's causing serious effects down the line." When Nicole Contreras, a New Yorker working in fashion design, heard of the bill, her first reaction was, "That sounds wonderful." "My brother just moved to Europe, partly because he felt overworked here," Contreras said. "Most people have that problem, especially if you don't have a union that protects you." Despite the almost-universal recognition that more could be done to maintain work-life balance, Espinal's bill is not without critics. 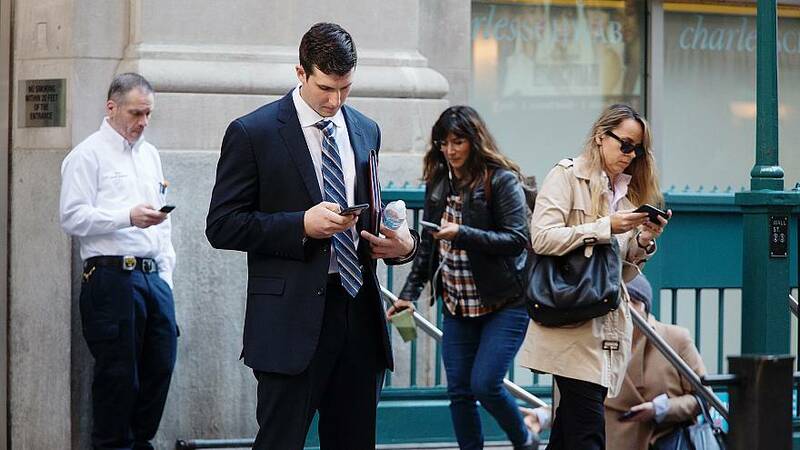 In a Jan. 17 hearing, Casey Adams, the director of city legislative affairs at the New York City Department of Consumer Affairs, explained his opposition to the "right to disconnect." "The DCA has serious concerns about our ability to effectively enforce a law that requires the agency to closely regulate the development and implementation of workplace communication policies by thousands of employers across hundreds of industries" Adams said. Limongi had the same thought. "I'm not sure how they would enforce it," he told NBC News. If it passes, the bill says companies that break the proposed law would be subject to a small civil fine. Adams said that while the department of consumer affairs shares Espinal's "concern about the effects that the advent of 'always on' communication," the De Blasio administration believes the city should focus on causes like ensuring reliable benefits and paid personal time for workers. "For professional employees with responsibilities, most of them want to be in touch and know what's going on if there's a problem," said Kathryn Wylde, president and CEO of Partnership for New York City. Wylde, who represents the city's business leadership and largest private sector employers, spoke in opposition to the bill at the City Council hearing. She told NBC News the bill is "a rather naive response to the notion of a work-life balance." "That's really the job of an individual," Wylde said. "To establish what their work-life balance is, when they want to disconnect, and to communicate that to their employer and work it out." Espinal said he isn't surprised by critics like Wylde. "If it were up to the business community, there wouldn't be any protections against workers," he told NBC News. "It takes the government to step in and create new protections." For Laricheva, the bill is a step towards making New York better for all. "I'm a workaholic, I'll admit it. But I also know it should be legal for a worker to disconnect," she said. "Why can't we work to make New York a more livable city, instead of just a playground for the rich?"